Dave currently uses the LP Mamo LP-229 bell and the smaller salsa ES-12 bell. They are mounted with a Yamaha boom arm clamped off the ride stand. TECHNICAL: LP Cowbells are handmade in the USA using the same exact specifications developed by LP Founder Martin Cohen more than 30 years ago. All LP cowbells are crafted from premium quality steel and specially developed tooling with careful attention given to the tolerance levels. A large variety of LP bells offers different pitches and sound characteristics designed to meet all musical needs and fit into any genre. All mounted cowbells feature the famous forged eye-bolt clamp assembly with oversized wing nuts that provide secure placement on 3/8" diameter mounting rods with only finger tightening. 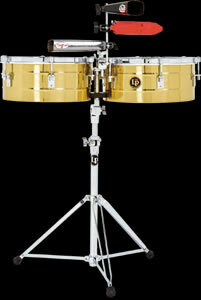 Dave uses LP LP257-B Tito Puente Timbales. They have a distinctive modern ribbed brass shell. The top and bottom edges are turned-in to create a livelier, more cutting "cascara"-the sound produced when striking the side of the drum shell. LP timbale construction has been tested on world tours from Japan to South America to ensure that it withstands the rigors of the road. The LP257-B timbale set is sold complete with a chrome-plated, heavy-duty steel stand and a die-cast geared tilter that locks tight for straight or tilted playing. The height adjustment mechanism with anti-rattle sleeve ensures absolute, non-slip, positive positioning with only hand tightening. LP includes an adjustable welded steel cowbell holder that employs LP's superior eyebolt assembly with the Tito Puente Brass Timbales. Click here to open the LP web site in a new window. Click here to visit the LP Web site.